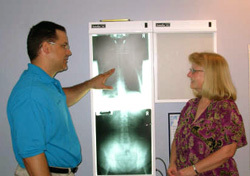 On your second visit Dr. Gamet will go over what he found on your exam and x-rays, explain what it means to you and go over a treatment plan to help you on your path towards good health. After that you will receive your first adjustment. Now remember this is only your first adjustment; the body has many layers and years of damage and decay, it will take many adjustments to start to correct and rebuild what has been damaged. Your second visit will usually take about 30 minutes.